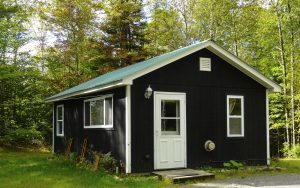 Our Cozy Cottage is exactly that – Cozy and Private- with a gorgeous view of Burke Mountain & The White Mountains. This cottage has everything you need for a cozy getaway for two. Enjoy a cozy stay in this cottage made for two! The private cottage comes with a queen size bed, tv/dvd player, bathroom, and kitchen. The kitchen comes stocked with cookware, utensils, a few spices/seasonings, oil, butter and local coffee. All towels and linens are provided. The outside of the cottage has a fire pit for your enjoyment on those starry nights. An outdoor grill is provided during warmer months. This space provides on site access to secluded walking paths that can be utilized during the summer and during winter with snowshoes. And, yes, we also provide snowshoes! We are conveniently located for an easy drive to Kingdom Trails, Burke Mountain, Hill Farmstead Brewery, Steam Mill Brook Wildlife Management Area, Bread & Puppet, VAST and much more! The VAST trail is accessible from the cottage. We are located near CA74 on the trail. Minimum 2 night stay. Please note that we do feed snowmobilers at our Lodge during the winter on Saturdays from 8am-3pm. However, your privacy is ensured, as the cottage is located behind a tree line and out of site from those that ride in.